The Arrow Advertiser was launched in June 2000 by John Harris, after a successful career working as an illustrator. His artistic background enabled him to create a local magazine which has a user-friendly layout and eye-catching design which makes it is easy to find what you are looking for quickly. Since launch, the magazine has gone from strength to strength and now has four editions delivered by Royal Mail every month to over 48,000 homes and businesses in the Stratford upon Avon, Alcester, Warwick and Evesham postcode areas. It is the essential guide for the local community to local businesses and tradesmen, local events and clubs. In a recent survey, 90% stated that they found The Arrow Advertiser a useful magazine for finding local businesses and services. A new Warwick Villages edition launched in 2014 delivered to 7,000 homes and businesses by Royal Mail, and in September 2018 the Evesham Villages edition was launched to all 8,000 homes and businesses in postcode WR11 7 & 8. - BLISS charity for premature babies. 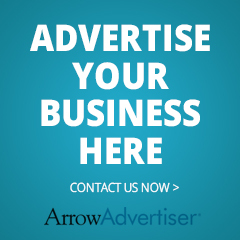 Contact The Arrow today to discuss your business advertising needs and find The Arrow Advertiser and John Harris on Twitter, FaceBook and LinkedIn.